Creation of unique content is not a new thing for the company Apple, which has already managed to create from scratch the radio Beats 1 and from time to time shot some videos for the musicians to broadcast exclusively in their Apple Music. However, according to recent reports, it is just the beginning and Apple TV is o its way to come out. 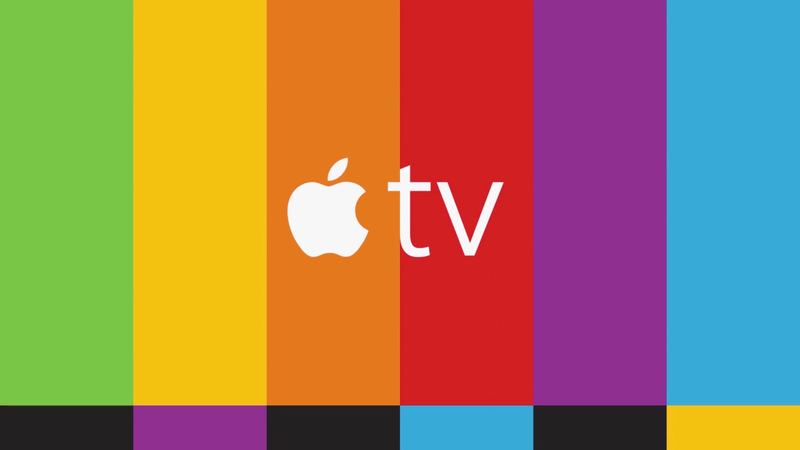 According to the report Apple has been speaking with TV studios and producers to create new TV shows that will be offered exclusively to iTunes users. It’s also said that these shows might be included in some kind of a TV offering that Apple is likely to unveil later this year in September. As the ”The Street” reports, currently Apple is the initial stage of negotiations with the representatives of Hollywood production about possible cooperation to create unique content. Presumably it comes to their own series and TV shows that will form the basis of its own subscription television service operating on the principle of Apple Music. I believe that it can be a real good move and there are some successful examples of such initiatives which we all know – Amazon and Netflix, which for a long time were simple distributors of content, began to produce the shows themselves, that brought them great success. It could be easily possible that after a while we watch series issued in the Apple studio. Nowadays multi-touch screens are used in majority of devices and the trend seems to be growing. Unfortunately it looks like the technology forgot about big group of people who cannot see the displayed content. In Poland there is about 90 thousand people struggling with blindness and about 315 millions of people with this disability all over the world. What is more the problem is predicted to grow. People who use Braille is about 150 millions of people. In general we are generation that is less likely to read things so instead there is more and more videos, pictures and iconographic. Fortunately there is a company that is developing technology which allows blind people use tablets. 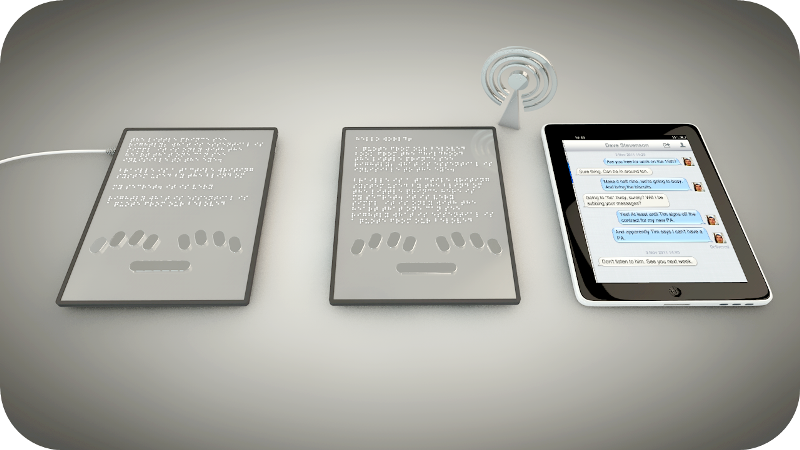 BLITAB® is the World’s first tactile tablet for blind and visually impaired people. It is a Braille device for reading and writing that displays one whole page Braille text, without any mechanical elements. We can compare it to an e-book which displays small physical bubbles. They rise and fall on demand, in a result one whole page can be read and can be written via Braille Perkins Keyboard. This is the first time that users can have an overview of a whole document. I believe that the idea is great and I do not understand why blind and visually impaired people had to wait for such a long time for this solution. It is already possible to sign up to pre-order. I hope that this solution will work soon and that more companies will think about peoples’ disabilities and improving their everyday life. Today I would like to share with you my recent discovery – hitRECord. It is an open community-sourced production company where anyone can contribute text, images, audio or video. Their page has quite a lot of options and I will try to shortly introduce some of them to you. On the “Main Page” you will see projects that company is currently interested in, so you can contribute to them and if they will pick up your work – it’ll be monetized. “Collaborate” page is place to start. 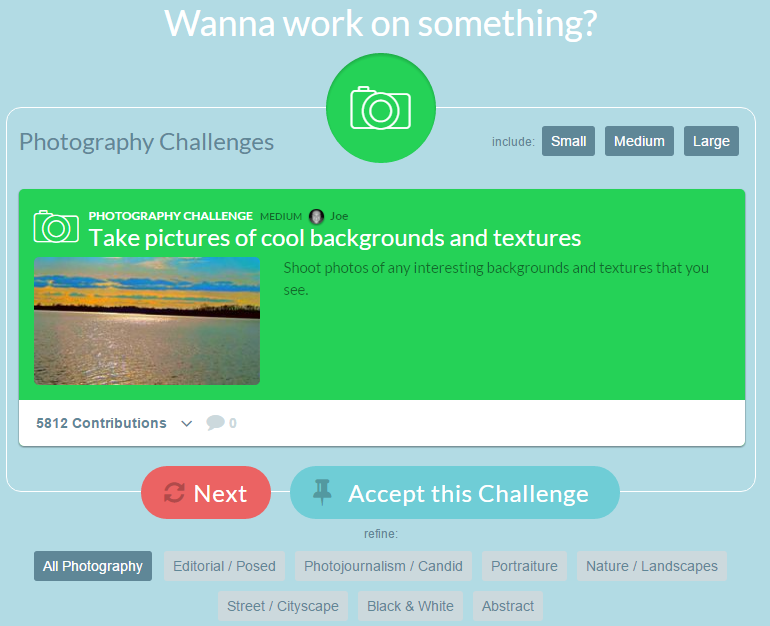 Here you can see ‘challenges’ – so a small creative tasks to do (for example creating one video), ‘projects’ – set of challenges, ‘productions’ – projects that are distributed through different channels like tv, events, books etc. You can collaborate by: writing, making illustrations, graphic design, photography, acting, editing, animation, vocals, music, voice acting or conducting interview. “Profile” Page – everything you are working on and you recommend shows up here. On your Profile page you will also see remixes of your work, and if someone comments or recommends it. If you want to feel as “Producer” the website gives you tools to create, manage and produce the whole Project. You can set goals, organize challenges, post schedule, communicate with collaborators and more. 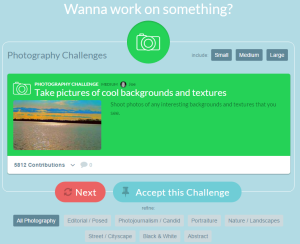 When it comes to Challenges – anyone can contribute to them as well as create one for specific project. If company picks up some work, adds it to Production and it’s getting monetized – contributors are paid. How? The hitRECord staff proposes a percentage that each record should receive, this “Proposal” is being published for whole community to review and staff is waiting for 2 weeks for feedback on it. Then feedback is getting reviewed by staff and they prepare “Final profit” document and soon after that all contributors are paid. What do You think about hitRECord? Are you gonna log in there and contribute to some project? Or is it just another social platform that you need to remember the log-in and password? I believe it is really great place for creative people and artists, where they can try their hands at various projects. Also, it’s place where you can have fun or just show your pieces of work and get some feedback. And btw you can make money on that 😉 If I had more free time I would try myself in ‘voice acting’, as it was my dream when I was younger and I would do it just for fun. What is more, in my opinion Joseph Gordon-Levitt had a really innovative idea with introducing this kind of collaborative production company. He and his staff are deciding what is getting published etc., but they have wide range of records to pick from and a lot of people willing to contribute. The idea is simple, yet brilliant. Nowadays, while focusing on the visions, strategies of companies operating within the automotive sector, it is possible to emphasize that more and more automobile manufacturers are deciding to develop specific technologies that could be implemented during the construction processes of the driverless, self-driving cars. After a deep analysis of the article “Ford’s Skipping the Trickiest Thing About Self-Driving Cars” it can be concluded that it is possible to distinguish two paths towards the automotive autonomy. Moreover, what has to be also emphasized here is the fact that the conventional – well known, “traditional” – automobile manufacturers are in the favor of a step-by-step approach, adding features one-by-one so humans cede control over time. Furthermore, it is also necessary to conclude that the group comprised of conventional automakers indicates that this approach gives them the opportunity to refine the technology, accustom consumers to the coming change, but also gives them the possibility to keep selling conventional cars in the meantime. Nevertheless, it is crucial to emphasize that Google perceives that as a complete nonsense and has decided to concentrate exclusively on fully autonomous vehicles that are not even equipped with a steering wheel. What is more, it is necessary to stress that Alex Davies, the author of articles concerning self-driving cars that are presented within this post, is of the opinion that Google – as well as Ford – sees no reason for the middle ground of semi-autonomy. In the world of automotive engineering, automation can be categorized into six classifications, from Level 0 to Level 5. The lowest level has not been equipped with any autonomous technology. Nevertheless, each additional level adds progressively sophisticated technology up to Level 5, in which computers handle everything and the driver – passenger is strictly along for the ride. 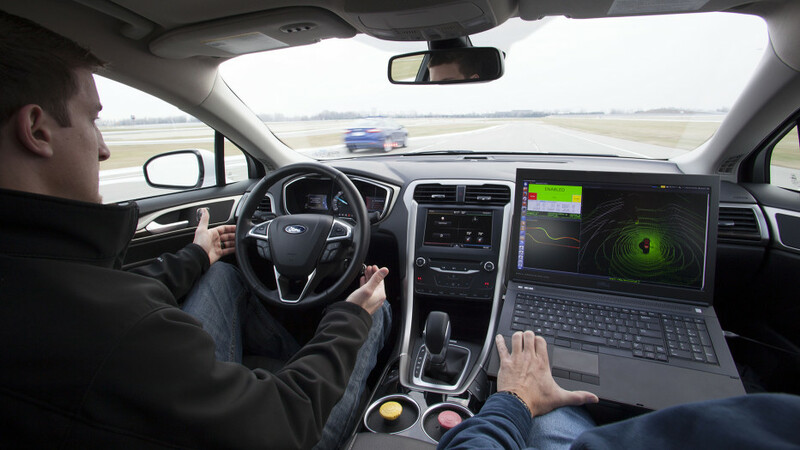 The Ford Motor Company has not said much about its plans for the autonomous age, however, it is crucial to emphasize that the company is road-testing a fleet of self-driving Ford Fusion Hybrids in Dearborn, Michigan, and expects to expand beyond its hometown. The company’s special Fusions are loaded with cameras, radar, LIDAR, and real-time 3D mapping to see and navigate the world around them, which in this case includes concrete, asphalt, fake brick, and dirt. Furthermore, what is also important to present here is the information that Ford is the first automaker to test a fully autonomous car at Mcity, the little fake town built just for self-driving vehicles. Mcity, officially known as the University of Michigan’s Mobility Transformation Center, can be characterized as a 32-acre artificial metropolis intended for testing automated and connected vehicle technologies. 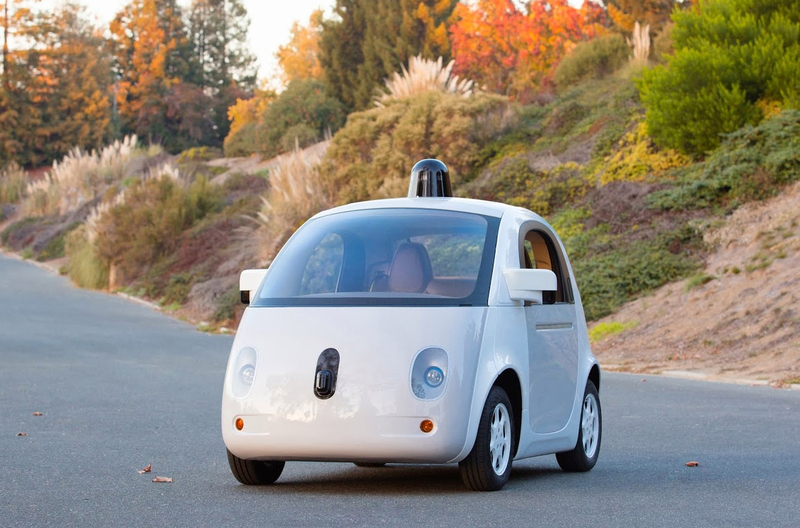 The company aims to offer a fully-autonomous car in five years. What is more, according to Alex Davies, Ford decided to concentrate on fully-independent vehicles because it wants to avoid problem with semi-autonomous technology. It has to be also emphasized that the Ford Motor Company, like a vast majority of automakers, operates at Level 2 – its cars can be equipped with plenty of active safety systems like blind spot monitoring, parking assist, pedestrian detection, and adaptive cruise control, but the driver is always in charge. What is also necessary to present is the information that with Level 3 capability, the car can steer, maintain proper speed, and make decisions like when to change lanes, but always with the anticipation that the driver will take over if necessary. It is possible to conclude that Ford aims to focus directly on Level 4 – full autonomy, in which the car is capable of doing everything and human engagement is strictly optional. Moreover, it is also possible to conclude that Ford wants to skip Level 3 because it raises, contains the one of the greatest challenges with this technology: how to safely assign – shift – control from the computer to the driver, particularly in an emergency situations. The author of the article, Alex Davies, describes that as a balancing act, one that requires providing drivers with the advantage of autonomy – not having to pay attention – while assuring they are ready to take the wheel if the car confronts, encounters something it cannot handle. What is also important here is the data presented by other automaker – German automobile manufacturer – Audi, which says its tests show it takes an average of 3 to 7 seconds, and as long as 10, for a driver to snap to attention and take control, even with flashing lights and verbal warnings. A lot can happen in that time (a car traveling 60 mph covers 88 feet per second) and automakers have different concepts for solving this issue. Audi has decided to implement an elegant, logical human machine interface. Moreover, Volvo, a Swedish premium automobile manufacturer, is creating its own HMI, and says it will accept full responsibility for its cars while using the autonomous mode. Nevertheless, both Google and Ford are withdrawing from this problem. “Right now, there is no good answer, which is why we are kind of avoiding that space,” stresses Dr. Ken Washington, the automaker’s VP of research and advanced engineering. “We are really focused on completing the work to fully take the driver out of the loop.” Even though the Ford Motor Company has not uncovered much about its capacities – how many cars are used within the test fleet, or how much ground they have covered –, Washington is of the opinion that a fully autonomous car within five years is reasonable, if work on the software controlling it progresses well. What is crucial to emphasize here is the fact that Ford would limit the deployment process of their autonomous vehicle only to those regions where it will be able to provide the extremely detailed maps self-driving cars will require. Furthermore, what is also important to present is the information that, currently, the American multinational automaker is using its self-driving Fusion hybrids to make its own maps. What is also important to stress is the information that it remains to be seen whether that is achievable at a large scope, or if Ford will work with a company like TomTom or Here. Dr. Ken Washington, Ford’s VP of research and advanced engineering, admits that the company’s strategy is pretty similar to Google’s, however it bases, it is comprised of on two crucial differences. First, Ford already builds cars, and will continue developing and improving driver assistance features even as it works on Level 4 autonomy. Second, Ford has no project concerning selling wheeled pods in which people are simply along for the ride. “Drivers” will always have the opportunity to take the wheel. “We see a future where the choice should be yours,” Washington concludes. Nevertheless the fact that the “self-driving cars age” has become inevitable, it is still possible to distinguish several problems to solve before the involved companies will enable the official deployment of these vehicles. It has to be stressed that one of the greatest challenges here is getting the robots to handle bad weather. Furthermore, what is also crucial to emphasize is the information that all the autonomous cars that are now in the phase of development use a variety of sensors to analyze the world around them. It is possible to conclude that the Radar and LIDAR devices perform most of the work – looking for other cars, pedestrians, and other obstacles –, while cameras typically read street signs and lane markers. Alex Davies, the author of the article “The Clever Way Ford’s Self-Driving Cars Navigate in Snow” stresses that during the bad weather conditions it would be rather impossible to scan the environment for those devices – “if snow is covering a sign or lane marker, there is no way for the car to see it”. Humans typically make their best guess, based on visible markers like curbs and other cars. 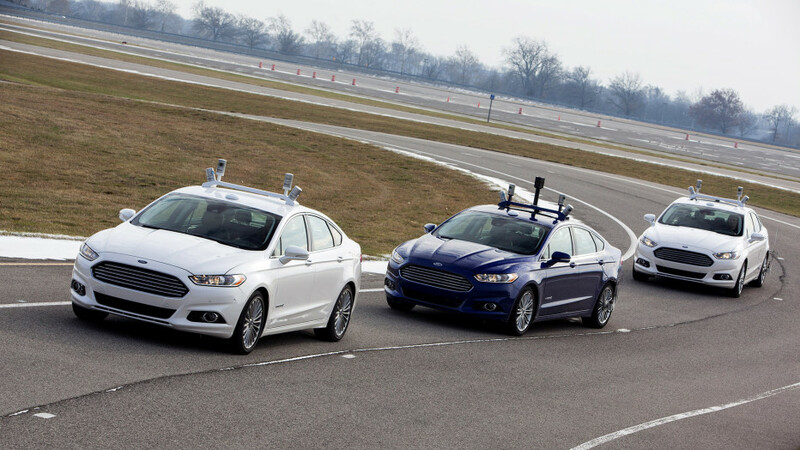 Ford says it is teaching its autonomous cars to do something similar. As it was emphasized above, the Ford Motor Company, similarly to other players in this area, is creating high-fidelity 3D maps of the roads its autonomous cars will travel. What is more, what has to be also presented is the information that those maps contain specific data like the exact position of the curbs and lane lines, trees and signs, along with local speed limits and other relevant rules. It is possible to conclude that the more a car learns about a region, zone, the more it can concentrate its sensors and computing power on detecting temporary obstacles – people and other vehicles – in real time. Furthermore, it is also crucial to emphasize that those maps have another advantage: the car can implement them to figure out, within a centimeter, where it is at any given moment. Alex Davies gives the following example to illustrate this point: “The car can’t see the lane lines, but it can see a nearby stop sign, which is on the map. Its LIDAR scanner tells it exactly how far it is from the sign. Then, it’s a quick jump to knowing how far it is from the lane lines.” Moreover, Jim McBride – Ford’s head of autonomous research – is of the following opinion: “We’re able to drive perfectly well in snow, we see everything above the ground plane, which we match to our map, and our map contains the information about where all the lanes are and all the rules of the road.” It is also necessary to stress that the Ford Motor Company claims it tested this ability in real snow at Mcity. 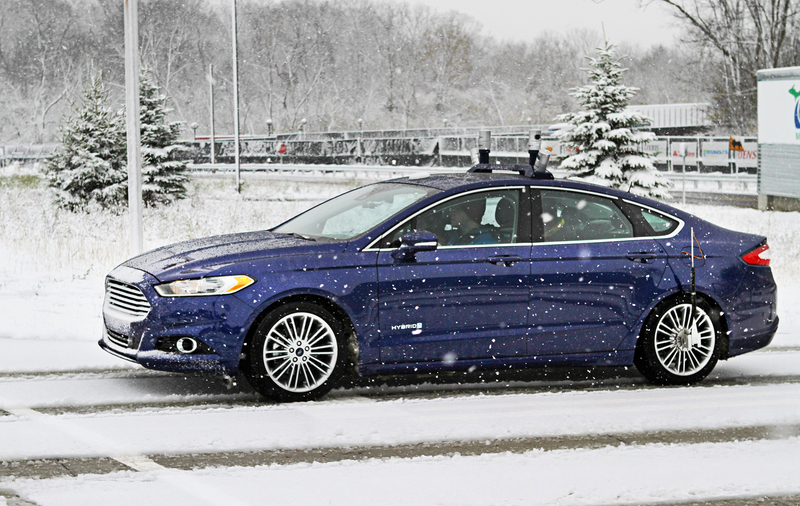 Nevertheless the fact that the idea of self-locating by deduction may not be exclusive to Ford, this automaker is the first one to publicly show it can use its maps to navigate on snow-covered roads. However, it has to be emphasized that the implementation of this technology has not yet solved all the problems with autonomous driving in bad weather. Falling rain and snow can interfere with LIDAR and cameras, and safely driving requires more than knowing where you are on a map – you also need to be able to see those temporary obstacles. I would like to stress that the broadly defined automotive autonomy is to be one of the most interesting topics of the nearest future. In my opinion, both of the paths towards achieving the Level 4 as well as Level 5 of automation are fulfilled with sophisticated solutions and processes. I have to admit that the second path – the path selected by the two companies that have decided to avoid the problem of semi-autonomous technology, Google and Ford, is even more fascinating. I would also like to emphasize that even if the cooperation between those two companies will not be confirmed, both Google and Ford will be within the group comprised of the most powerful automobile manufacturers that will compete in the race for full automation, and within five years’ time we will have the opportunity to test how it is to use our vehicles without the necessity to drive. Furthermore, it is also crucial to remember about the two of the main elements enabling self-driving cars to ride – about the projects regarding the high-fidelity 3D maps that together with Radar and Lidar devices will be deployed in the autonomous vehicles. I believe that the systems composed of Lidar scanner and 3D maps will provide us the most accurate artificial drivers in terms of broadly defined safety. All things considered, I would like to emphasize that even though the age of autonomous vehicles is on its way, it is still possible to distinguish several problems to solve before we will be only acting – voluntarily – as passengers (behavior of the system at the high speeds, issue of trust, bad road conditions, and emergency situations). One more accident featuring an Uber driver has taken place. We have already heard numerous times of Uber or Lyft drivers being involved into sexual assaults, kidnapping cases, harassment incidents etc. (Who’s Driving You 2016) This time the story is about an Uber driver from Florida pointing a gun at his passengers. Mr Fabry and his friends were picked up by an Uber driver, Mr Mcdonald. Mr Fabry felt sick on his way home so he asked to stop a car for a minute. When the driver stopped, Mr Fabry told him to continue as he felt better by then. That moment Mr Mcdonald tried to drag his passengers out of the car, telling Mr Fabry that he could not be sick in a $75 000 car. Then the driver took a gun and pointed it at Mr Fabry. Later, McDonald admitted to police he was holding a gun but he refused the fact that he was pointing it at Fabry. McDonald has already been released on bail. Does Uber seriously think that this is the only thing they can do? All of these incidents are pushing away even the most loyal clients of Uber. The company should take serious measures to prevent future incidents. Testing mental health of the drivers might be an option. The last thing to note, when a similar accident happens in Poland, I will better use a tram or metro. 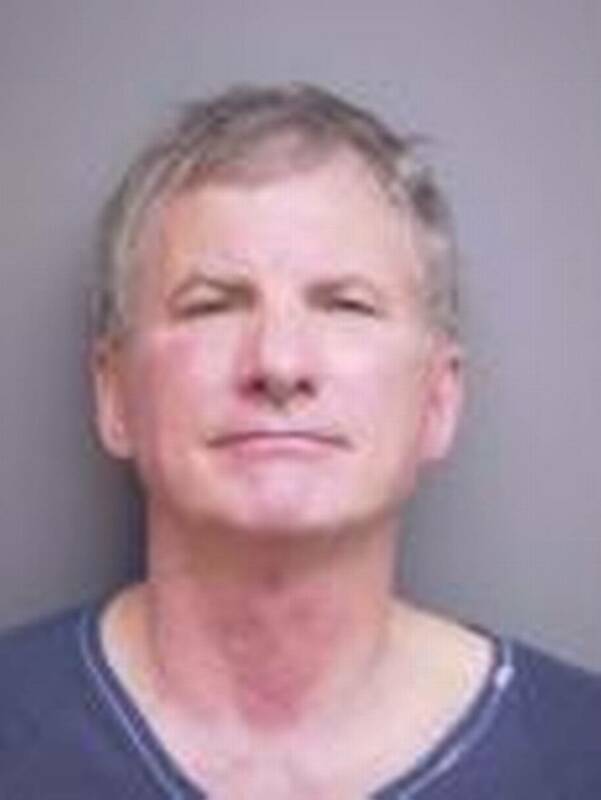 Irby K. (2016), Uber driver charged with pulling gun on passenger in Bradenton, Bardenton Herald, Available at: http://www.bradenton.com/news/local/crime/article56439200.html. Rawlinson K. (2016), Uber driver ‘pulls gun’ on passenger in Florida, BBC, Available at: http://www.bbc.com/news/technology-35410676. Who’s Driving You (2016), Reported list of incidents involving Uber and Lyft, Available at: http://www.whosdrivingyou.org/rideshare-incidents. Future of jobs: Fragile or highly perspective? Hi, it’s me again. Today I’d like to address my thoughts on the future of jobs, which are backed by the latest forum in Davos that went under the topic: “The Forth Industrial Revolution”. “What a great future is waiting for us” – this is due to the talks that we’re going towards jobless reality where people will be free of any physical work and repetitive tasks. Future, where “boring stuff” will be done by AI and people will switch towards things they really like doing. Another idea mentioned on the forum was about basic income – fixed transfer pay, assigned for basic needs (e.g. food, maybe living and clothes) and given for nothing (no work required to get the money), so that people could stop worrying about their tomorrow-day, become less stress-exposed and switch towards “important stuff”. On the other hand, however, I am worried now, really. All the mentioned changes come too fast. I even learn how to code, and although I like it, the second reason for doing so is my fear of being unemployed in the future. And it is just about me, but what’s going to happen in a larger scale when AI will substitute people? 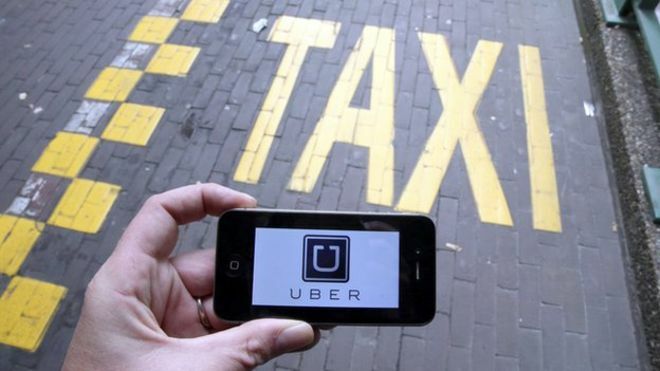 We laugh at taxi drivers, since their job is unnecessary anymore amid popularity of Uber, but they seem to be unwilling to accept such radical changes and protest, by burning tires and other things people do when they disagree. I am quite anxious about such scenarios in larger scale, aren’t You…? Who’d knew that rescuing passengers from catastrophy-dangered plane could be so easy? Maybe this solution isn’t the most simple one from the technological point of view but from the logical point of view it is – if plane os going to crach the easiest way to rescue passengers is to.. remove the cabin and make it come back to the ground on parachutes. Is that a future of commercial flying? Well it depends. You must be aware that this is not an idea that came from Boeing or Airbus but from the independent Ukrainian aviation engeineer (Vladimir Tatarenko) so despite it is great (in my opinion) it would be really hard to implement it into future plane constructions. Large corporations like to buy various solutions but rather to prevent competition for using it. what will happen with detached part (with the wings and engines). Would it fly wherever and crash in random place? Imagine it in the city! what will happen with pilots? Are they staying to control detached part or go to be safe with passengers in the cabin? from the movie we can see landing on the flat ground and water, but what would happen in the mountines? Would it crash or expose passengers for dangerous situations? As you can see brilliant ideas are not always the easiest ones to implement. We must think if already existing solutions are enough reliable or if we need to modernize this part of public transportation. P.S. : That is my last 5th post. Hope you didn’t get bored. Thanks for reading. What is the future of our education system? One more ecologically-friendly innovation is being presented to the public. This time we are fighting with draughts and trying to decrease our water consumption. California-based engineers have invented a shower head that is able to change our way of taking a shower. Their innovation project has resulted in a shower head which transforms water streams in small droplets (“millions”). This technology gives a 10 times bigger surface of water while using just 30% of the volume. In addition, the firm states that the shower will make you save tremendous sums of money on water consumption. They say the shower pays off within two years already. Nebia claims that their shower not only saves water and your money but also brings you skin softening and hydrating experience. Sounds reassuring. Although its price is not as pleasant: $399. Saving the planet is always an urgent issue. But nobody wants to be the one to start with himself. Especially when it comes to paying $400 and my old shower does its work quite efficiently. The success of the project might happen thanks to its future money saving. Prices for water consumption are rising in many countries. Here can be found a real reason to purchase a smart shower head. But if I am taking a decision to buy something for $400 I want to be sure its a good product which is worth it. But how can I be sure about a shower head? How can I try it? Here is Nebia’s food for thoughts. Cave J. (2015), Vaporizing Shower Head Will Change The Way You Wash Yourself, Huffington Post, Available at: http://www.huffingtonpost.com/entry/nebia-shower-head_55f05bc0e4b03784e277636e. Williams A. (2015), Tim Cook backs water saving shower head, GizMag, Available at: http://www.gizmag.com/nebia-water-saving-shower/38886/. There are several reasons why this concept of quadcopter-ambulance is better than helicopters which are known nowadays. First of all, this concept is powered electrically. That means no emissions, easier to service parts and also quieter. What is more, it is eco-friendly, that argument should help us when applying for a funding it from EU funds. Drone technology is simpler mechanically than traditional helicopter technology. More and more parts can be 3D printed. To compare it with traditional helicopter which has dozen of parts which are moving in presented concept of quadcopter there are only 4 moving parts. In practice it means that drones are much simpler to maintain. Next, having 4 small sets of rotors means less kinetic energy is held by any one of the moving parts at anyone time than you would find in a helicopter rotor. This means in the undesirable event of a crash there would hopefully be less damage caused by the rotors, as opposed to the damage a helicopters rotors could cause. Ultimately the reason drone technology like this is becoming popular because it’s easier to automate than mechanical systems such as helicopters. Drones can fly themselves with relative ease, whereas automating a mechanical helicopter is significantly harder. Also, there’s the matter of space. A helicopter would have trouble landing close to a building. However, there is still one issue to solve. Patients should not wait in the queues after getting to the hospital.